Please refer to our stock # Koitsu466 when inquiring. Date: 1930s. First and only edition. Size: Chuban. Approximately 11.5 x 7.75 inches. Publisher: Takemura Hideo. Takemura seal at lower right. H. Takemura stamp on verso. Koitsu's "kiyoshi" seal at lower left. Condition: Excellent. Top back corners have residue. 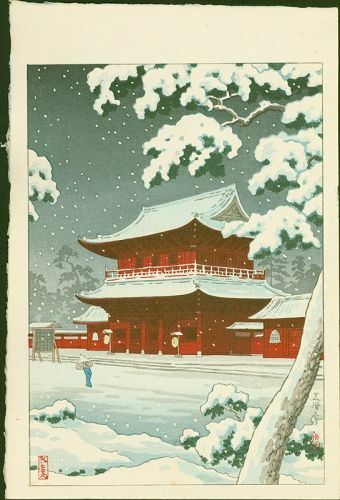 This very rare print features beautifully embossed snow.